Peacock flower or Caesalpinia pulcherrima is a species of bulbous plant belonging to the pea family or Fabaceae family and subfamily Caesalpinioideae. It is native to tropical and subtropical regions such as the West Indies and tropical America. This plant has the ability to grow up to 15-20' tall in the tropical environment. The C.putcherima is an ornamental plant that is very commonly grown species of the peacock plant. It is adorned with red, yellow and orange bloom. This beauty of the flower has the ability to attract hummingbirds and bees that helps in the pollination process. Peacock is an easy growing plant, it has showy appearance and it grows from summer to fall. It has spiny stems and has fern-like appearance. 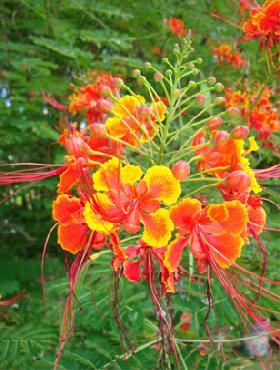 It has lots of common names, namely Poinciana, peacock flower, red bird of Paradise,Dwarf Poinciana, Maxican bird of paradise, Gold Mohur, pride of Barbados, ohai, Barbados Flower-fence, etc. Peacock flower is sensitive to cold; it stops growing and at times die in cold climate but it restarts to grow once the spring season arrives. It can survive in almost any type of climate such as warm to desert climates. Symbolically, Caesalpina pulcherrima is the national flower of Caribian island of Barbados. Flower: Just as the name suggests, the peacock flower is adorned with the mixture of beautiful color such as yellow, orange and red blossom. One of the unique feature of the flower is that it can tolerate extreme heat. The flowers come in bowl shaped- the petals are designed unequal with red, orange and yellow blossom. Plantation: To make the plantation of the peacock easy and worthwhile, you will need to plant this bulb in an alkaline or acidic soil also making sure that the soil is well-drained. It is a rapidly growing plant and can be shaped into a bushy shrub from or to a tree shaped. In this way the well shaped peacock flower serves as a good garden border. Uses: The peacock flower has several uses. It has the history of ancient folk medicine to cure minor injuries and relieve fever. It serves as a weight loss property and also as an antiseptic and an anti-inflammatory. The mixture of leaves, bark and roots when properly boiled serves in relieving kidney pain, fever, sore throat problems, jaundice and gastrointestinal disorder. There are a few medicinal uses of peacock flower. To abort in the first trimester of pregnancy is helped by the intake of four grams of root. The extracted juice of the flower is often used in washing eye. This juice also works as an insecticide when applied the body. patients with respiratory tract problem is helped in chewing the seed of the plant. Food: It has been found that all the seeds of C. pulcherrima are poisonous. But yes, it is possible to eat the immature seeds, tested or roasted seeds of some of peacock flower. There are a few medicinal uses of peacock flower. Taking four grams of root is helpful in aborting a pregnant women during her first trimester of pregnancy. Peacock orchid: Peacock orchid is another form of the peacock flower belonging to the iris family. Thus, it is not regarded as an orchid. It is botanically named as Gladiolus callianthus. It presents showy blossoms that produce fragrant. Unlike Caesalpinia pulcherrima,peacock orchid can be planted in the container as well as in the garden soil. Peacock orchid flower: The blossom is white with maroon color at the center. It is purely beautiful and eye catching. Peacock orchid leaves: The leaves of the peacock orchid is also unique, it has the appearance of sword, green in color and has a little amount of red color toward the base. Plantation of peacock orchid: It is not a tedious task to plant the peacock orchid in your garden and indeed it will look the most beautiful flower in your garden with its unique and attractive appearance. However, there are some things to keep in mind during the plantation. It is suggested that you space the bulb 3-6 inches apart making sure the soil is moist, well-drained and properly fertilized with composted manure. Also keep in mind to plant the bulbs 3 to 5 inches deep into the soil. It can be planted in any climatic zone but preferably summer and if you plant the bulbs in the winter, make sure to plant it during the afternoon time when the sun is bright and hot. Peacock orchid care: Like all the other plants, taking care of the Peacock orchid is simple and easy. Make sure to plant the bulb in the damp soil and on a hot afternoon. In areas where the winter is extreme, it is suggested that you store the bulbs indoor making sure you clean and dry the bulbs well. Also make sure you dig out the bulbs only when the foliages have yellowed. It is good to keep them in the room temperature i.e. keeping away from freezing temperature or the direct heat. It is good to store them in the peat moss so that they get enough air to breathe. One of the other good and easy ideas is that you can add a layer of leaves, branches…over the soil so that you need not dig the bulbs. However, you are suggested to divide the bulbs after a couple of years.